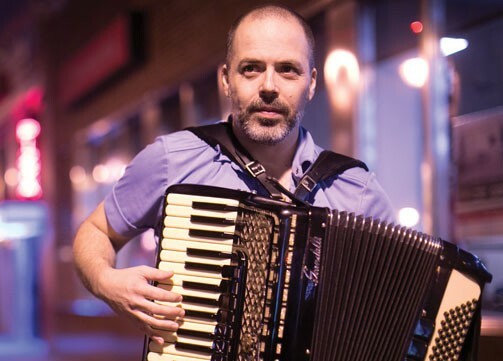 Rob Curto is an accordionist, composer, arranger and keyboardist based in New York City. He is a founding member of the band Matuto which was selected to showcase at WOMEX (world music conference) He has released 4 CD’s as a band leader and is a prolific composer/arranger. His musical collaborations include performing and recording with Latin Grammy award winner Lila Downs, Klezmer clarinetist David Krakauer, trumpeter/composer Frank London, Punjabi Indian singer Kiran Ahluwalia and icon of Brazilian Forró, the great accordionist Dominguinhos. He is widely regarded as forró’s foremost ambassador in the States. An early devotee of North American swing music, bebop piano, funk, rock, and blues, he has combined these influences with his mastery of their Brazilian counterparts forró, chorinho, samba, maracatu, and frevo to produce stunning new results. He spent years living and playing in Brazil, completely absorbing and interpreting the country’s musical traditions. BRAZILIAN FORRÓ BY ROB CURTO at Terraza 7 on Saturday January 31st, 2015 at 10:00 pm. No Replies to "BRAZILIAN FORRÓ BY ROB CURTO"